We have shortly discussed three world famous Cambrian period Konservat Lagerstätten that are today located very far from each other: Middle Cambrian Burgess Shale in British Columbia, Canada, Lower Cambrian Emu Bay Shale in Kangoroo Island, Australia and Lower Cambrian Maotianshan Shales in the Maotianshan Hill,Chengjiang County, China. The dating of ancient rock strata is nasty business. 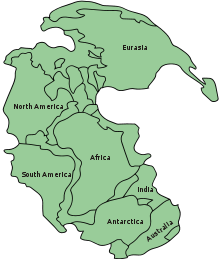 In the beginning of the Cambrian era some 500 mya these locations were all in the massive Pangaea supercontinent breaking up as result of tectonic processes on the spinning planet Earth. The divine Nature Reserves have then traveled with the continental plates to their present locations in the continents of Asia, Australia and North America separated from each other by oceans. Earth scientists use chronologically sequential terms like "Lower, Middle, and Upper Cambrian" to indicate a relative dating for the rocks. But establishing such classifications in detail is not at all simple. Continuing movement of tectonic plates not only carried indicative Konservat Lagerstätten far from each other. They totally messed up the neat overlaying deposits that were formed in the bottom of oceans with continuous folding, breaking up, pushing down and forcing up of the deposits. For example, the impossibly complex Triassic and Jurassic deposits in the Alps have rockstrata from much earlier periods over younger rocks because uplifted mountains fall over and covered large areas of deposits from later periods. This could happen, for example, when using Tribolite zones for dating geological deposits. Geologists are constantly discussing the suggested sequences and try to standardize a global chronology with the help of also other than fossil evidence. Various Atomic clocks are used to measure the usually quite faint levels of natural radioactivity. On basis of the known decay rates of matter Physicists can suggest a date for the sample. Atomic clocks provide absolute dates for the relative sequences created by comparing geographical strata with the help of fossils and other elements embedded in the rocks. The discovery of longer undisturbed sequences of Cambrian rocks covering several stages is, of course, a rare treasure and provides a measuring yard for the less well-preserved sequences. Taken together, biostratigraphy and radioactive clocks have provided what is considered a reasonably reliable general chronology for Earth's crust - leave or take a few million years. The Cambrian period follows the Ediacaran and is followed by the Ordovician period. The Cambrian is divided into four epochs or series and ten ages or stages. Currently only two series and four stages are named and have a Global Boundary Stratotype Section and Point (GSSP). Upper (Late) Cambrian (499 ± 0.3 to 488.3 ± 1.7) also known as Furongian, Merioneth or Croixan). Trilobite zones allow biostratigraphic correlation in the Cambrian.